Altank's Reviews: Chapter XII, The PTZ-89. In 1978 the PLA officially approved the development of a Western-style 120mm high-pressure smoothbore gun, which was to constitute the main armament of both the Feng Bao MBT and the future division self-propelled anti-tank gun system. The first three prototypes of this 120mm smoothbore gun were completed in 1979; and from February 1979 to October 1980 over 1000 APFSDS rounds were test fired from these guns. On 27 February 1979, the 82-2 design achieved a penetrating hit against a 204mm armour plate sloped at 68° degrees, at a speed of 1646m/s. Subsequently, among several design proposals, the 82-14 one was chosen as the final design, with fire tests showing that the muzzle velocity of this 120mm smoothbore gun could even reach over 1700m/s. 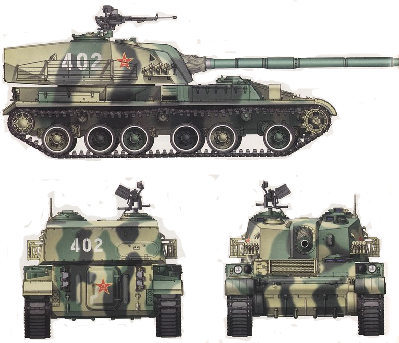 However, due to political reasons, the PLA decided to give up the Western-style 120mm smoothbore gun design in favour of the Soviet-style 125mm smoothbore gun design, which had two distinctive advantages: the automatic loading system and the ability to fire anti-tank guided missile (ATGM). 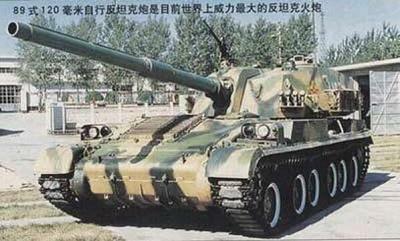 Nevertheless, the 120mm smoothbore gun project continued to be developed as an anti-tank weapon system, eventually leading to the introduction of the Type 89 (PTZ-89) self-propelled anti-tank gun. The prototype of the PTZ-89 was completed in 1984, and underwent trials in the same year. The APFSDS rounds fired by the anti-tank gun could penetrate a 450mm armour plate at a distance of 2,000m. Various tests were carried out between 1987 and 1988 before the initial batch production began in late 1988. By 1989 around 20 examples were delivered to the PLA, and the Type 89 received its design certificate in 1990. It is estimated that more than 100 vehicles have been built so far. 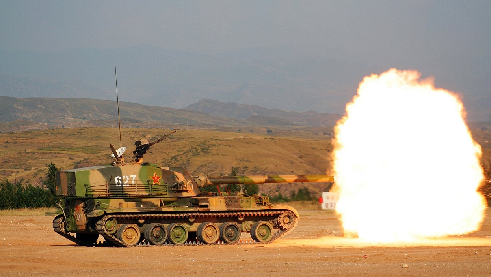 The Type 89 is based on the Type 321 utility tracked chassis, the same chassis used by many artillery weapons in service with the PLA, including the Type 83 152mm self-propelled howitzer and the Type 89 multiple rocket launcher. The powerpack is located in the front of the vehicle, with the turret and combat compartment in rear. The maximum road speed of the vehicle is 55km/h. The driver is seated in the front-left, with the commander, gunner and loader seated in the combat compartment. A rear hatch is provided for rapid loading of ammunitions. Despite the PTZ-89’s success during testing, the necessity of such a weapon system became questionable soon after it entered service. Moreover, following the end of the Cold War and the restoration of Sino-Soviet/Russia relation in the early 1990s, the possibility of a large-scale invasion on China’s land has become highly unlikely. The PTZ-89 is mid-high-tier Chinese tank destroyer, featuring a price of 9500 silver coins (this purchase option is unlocked once reaching rank 33, First Lieutenant Grade 1) or of 590 gold coins (this purchase option is unlocked once reaching rank 29, Second Lieutenant Grade 1). 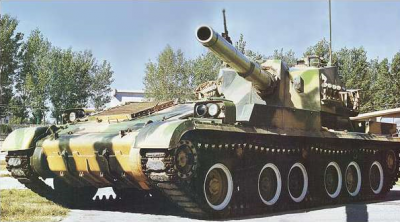 Starting at level 46 and reaching level 52, the PTZ-89 has the second highest level among the tanks featured in the Chinese line, alongside the Type 85, and, despite being one of the most overlooked units in the entire game, is, nevertheless, also one of the most versatile and powerful ones at its tier, as well as being an excellent moneymaker. 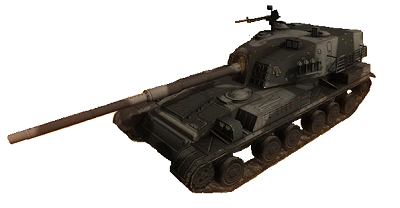 The PTZ-89 features a two-tier hull upgrade; both of them are required in order to acquire most of the other upgrades and don't change the tank's appearance; as of patch 1.22. Health pool upgrades: three-tier upgrades available. The PTZ-89 doesn't feature any health upgrade; however, the base health pool is definitely above average for its tier, somewhat making up for the complete lack of armor. Spaced armor upgrades: one-tier upgrade available. 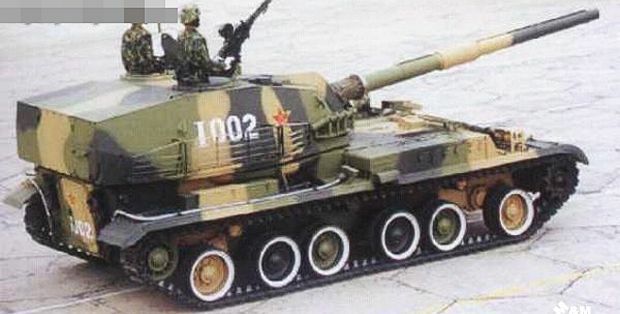 The amount of passive armor protecting the Type 89 is low, about 50mm, partially due to the limitation imposed by the Type 321 chassis' maximum load capacity. The turret, however, is protected by storage racks to provide additional protections against HEAT rounds. There are four smoke grenade launchers on each side of the turret and additional smoke can be generated by injecting diesel fuel into the engine’s exhaust. The crewmembers are protected by a collective NBC protection system and an automatic fire suppression system. It doesn't come, therefore, as a surprise that the PTZ-89 doesn't feature any armor upgrade at all, with the only exception of a single-tier upgrade of spaced armor, which, however, is highly ineffective and only present on the sides of the turret. Also, another downside of the PTZ-89 is the total absence of any kind of active protection system, making this tank vulnerable to ATGMs; however, since tanks can carry only a limited amount of ATGMs, unlike any other different type of ammo, they are subsequently rarely used, thus making this downside quite bearable; besides, the tank destroyer, as said above, can be fitted with smoke grenade dischargers, which provide protection from this threat. Main armament upgrades: two-tier upgrade available. The main armament is a 120mm/50 high-pressure smoothbore gun with a thermal sleeve and a semi-automatic gun loader. The fume extractor is located in the middle section of the gun barrel. The gun can fire 10 rounds in one minutes and the vehicle can carry a maximum of 30 rounds. The PTZ-89's main gun can fire a wide range of rounds. The APFSDS round has a muzzle velocity of 1660m/s and a maximum fire-range of 2500m. The high explosive (HE) round has a muzzle velocity of 960m/s and a maximum fire-range of 9000m. Fire accuracy is attained by a TSFCS fire control system with night vision and laser rangefinder input. The PTZ-89 features a two-tier upgrade of the main gun, which gives a bonus to the damage and a bonus to the accuracy; while, however, also giving a malus to both speed and trasmission. The tank destroyer's damage is slightly above average for its tier, nevertheless, this, combined with the good reloading speed, grants the PTZ-89 a high DPM. It's also worth mentioning that the gun is very accurate, even while moving and using HEAT rounds, despite the fact that, as said above, in real life, the 120mm/50 isn't fitted with any kind of stabilisation system. High Explosive (HE): three-tier ammo upgrade available. The PTZ-89 is powered by a liquid-cooled, turbocharged, 12-cylinder, 4-stroke 12150L diesel engine, which provides 520 hp; as a result, considering the vehicle's weight of 31 tons, this tank destroyer features a decent power-to-weight ratio. Operational range is about 450km without additional fuel tanks. 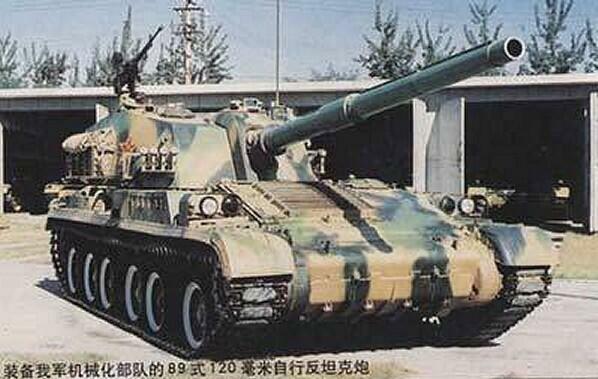 Despite a three-tier upgrade of the engine, the PTZ-89, although being extremely agile, doesn't reach an exceptional maximum speed, which is definitely lower than most of the units' this tank destroyer faces on the battlefield. This is a major downside as, when fighting at close range, you may not be able of outmaneuvering your opponent. It's also worth mentioning that the engine compartment is located at the front of the fighting vehicle: the PTZ-89 is thus very prone to engine breakdowns and engine fires, which, in most of the cases, result in your immediate death. The main gun is fitted with a semi-automatic loader; a three-tier upgrade of the reloading system allows this tank to achieve an above average reloading speed, which, combined with the good damage dealt by its main gun, grants the PTZ-89 a high DPM. The PTZ-89 features a two-tiers upgrade of the turret rotation system, thus achieving an average turret rotation speed. Infrared optics upgrades: one-tier upgrades available. Fording kit upgrades: no upgrades available. -Decent health pool, somewhat making up for the complete lack of armor. -Amazing power-to-weight ratio: this tank is extremely agile as well as featuring a great acceleration. -Good reloading speed, which, combined with the good damage dealt by the main gun, grants an excellent DPM at its tier. -Complete lack of passive and reactive armor. -Complete lack of active protection system. -Spaced armor is rather ineffective. -Maximum speed is lower than most other units' at its tier. The PTZ-89, as already said, isn't ranked among the highest-tier units featured in the Asian tech tree; however, this tank destroyer is, nevertheless, one of the most effective and powerful units at its tier, being perfectly capable of dominating the battlefield and turning the tide of battle with relative ease. It doesn't come as a surprise then that the PTZ-89 is also an excellent moneymaker if you avoid higher-tier rooms: getting one is highly recommended. This tank destroyer is a highly versatile unit, capable of covering a wide range of roles and proving excellent at close-quarters fighting as well as at long range engagements: despite not being fitted with any kind of stabilisation system, the main 120mm/50 is a very accurate gun, even when firing on-the-move and shooting HEAT rounds. Hence, this tank destroyer is exceptional at sniping, expecially at putting flanking shots into enemy tanks from strategic positions, thus making the best use of its high DPM; most of the times, in fact, the tank you're shooting at will be dead before even realizing where you are and taking countermeasures. A good tip is to buy and upgrade the smoke granade launchers system: as said above, the PTZ-89 lacks any kind of active protection system, and most enemies will realize that the fastest way to get rid of you shooting from a strategic position, is by using ATGMs. Therefore, as soon as you notice an enemy firing an ATGM at you, quickly activate the smoke granade launcher system to avoid being hit and, in the case, relocate or wait before getting back into position. The PTZ-89 is one of the most overlooked units in Tanktastic and finding one on the battlefield is a rare event; however, be sure you will remember the encounter, as this is also a very effective and powerful tank destroyer, as well as often being driven by experienced players. Take full advantage of the PTZ-89's downsides, however, and you will have no problems whatsoever when dealing with one: first and foremost, this tank destroyer, as previously said, completely lacks of passive and reactive armor upgrades while its spaced armor is almost negligible and only present on the sides of the turret, so, if you want to stick to HEAT rounds, avoid shooting there when possible, otherwise, just load HE rounds to deal high amounts of damage. Always avoid letting a PTZ-89 close the distance: remember that this tank destroyer's speed isn't great and you can prevent one from effectively outmanoeuvring you simply by promptly reversing when spotting one starting to engage you. Another major downside of the PTZ-89 is the engine compartment being located at the front of the fighting vehicle; this makes it extremely prone to engine breakdowns and engine fires, and a stationary PTZ-89 on open ground is a dead PTZ-89: take advantage of this to make short work of one and prevent your opponent from performing evasive maneuvers or try and outflank you. Here I end my review of the PTZ-89, emblematic example that size doesn't matter. Wow! Excellent job man. Since it appears your laptop is fixed, can you show us the Kubinka Pics? Good job again, Altank! Thanx a lot. 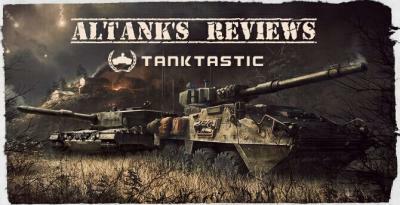 A altank review! Is this a dream? a 5mm thick moving ball with a soldier squeezed in it. 13/10, great tank. This is one of the rarest tanks that you can see in battle , i think i only encoutered jersh's.